“through too many imitations, and had indeed often robbed the best passages of their effectiveness. This addiction to imitation is almost an illness…” 4 . One would imagine, then, that Bruckner would make simplification of his scores a top priority, and so it was with the Volksfest finale of the Fourth dating from 1878, where many elaborate canonic passages in the version nominally of 1874 were dropped in favor of much simpler textures. To show whether the same thing happened in the Third, which was further revised in 1875 and revised substantially in 1877 and probably in 1878 after the premiere as well, and to determine the subsequent history of the relevant passages, is the purpose of this paper. The 1874 version of the whole symphony is, movement for movement, of the same length and structure as the 1873 original, although there is an alternative slightly-shorter ending for the first movement nominally from 1875 which came to replace the ending which had been unaltered in 1874. But there are many passages, particularly in the first movement, with major changes in texture and orchestration made in 1874 as shown in Mus.Hs. 6033. The first of these changes to be encountered is in the second crescendo of the A theme, measures 79–118, where the trumpet entrance with the motto theme at measure 83 is echoed canonically by the flute at measure 85. This can be seen in Example 1, which shows this crescendo based on a pedal A in the versions of 1873, 1874, and 1877, one below the other for easy comparison. (The woodwind chords are shown schematically on the top staff, with some octave transpositions needed to render the full harmony on the one staff.) It can be seen that at measure 85 Bruckner replaced two flute notes with a valid imitative entrance of the motto theme. Then at 89 the next flute entry, already imitative in 1873, was in 1874 raised in pitch to give it more prominence; this was also done at 93 and 97. The imitation in diminution beginning at 105 is already present in 1873, but in measures 111–118 a truly complicated texture in the horn and trumpet parts deriving from the rhythm of the motto theme in double diminution was introduced in 1874. These textures are similar in character to those shown in the Collected Edition’s early version of the Fourth, in both the first movement and finale. The first crescendo of this movement, based on a pedal D, leading to the unison A2 theme also in D minor, was not elaborated, perhaps because it is not given over to a development of the motto theme to start with, but instead to its melodic extension. Now in 1877 both crescendos were shortened, the first by ten measures, and two measures of the background at the beginning of the second crescendo were deleted, so that for 1877 Example 1 begins at measure 69, parallel with measure 81 for the 1873 and 1874 versions. For the first eight measures, 83 through 90, the innovations of 1874 were retained in 1877, but the subsequent eightmeasure phrase of 1874, measures 91–98, was subjected to diminution in 1877, becoming the four measures 79–82. This can easily be seen by following the trumpet and flute parts, which retain their pitches though halved in length. Meanwhile the second horn makes a series of new entrances, in the same rhythm but in contrary motion, following the trumpet and preceding the flute. Continuing, we see that the twelve measures 99–110 of 1873 and 1874, where after eight measures the motto rhythm is finally diminished, have no counterpart in the revision of 1877, which skips ahead to the place where in 1874 the trumpet and horn play the motto theme in double diminution. Yet in 1877 this texture of double diminution is further elaborated, with new entries of the third trumpet in inversion, following the upper trumpets and preceding the horn. The trombone entrance is also made more compact and urgent leading to an entrance of the A2 theme in B flat major, which itself is more densely orchestrated than in 1873 and 1874, though made more compact and deprived of a canonic response in the trombones. Overall, including the introductory background material omitted from Example 1, in 1877 the second crescendo was shortened from 40 measures (mm. 79–118) to 20 measures (mm. 69–88), but the canonic orchestration toward the end was increased substantially. Then in Example 189, the 1877 and 1889 versions are shown in parallel. They begin at different measure numbers, because the two rest measures which in 1877 separate the two crescendos were eliminated in 1889. After that they are the same for twelve measures, only diverging at the upbeat before the final six measures of dense imitation. But in those six measures, new music for the second horn and third trumpet make the texture even more ornate. We are forced to the realization that in 1877 and 1889, Bruckner did not think that the reservations he had expressed to Tappert in the former year applied to this passage. The next music to be considered is near the beginning of the development. In 1873, Bruckner began the development at measure 285 with chords continuing the codetta at the end of the exposition, followed by the motto theme in augmentation played by the solo horn. He then designed three passages, in F minor, G minor, and A minor, in the first two of which the motto theme in inversion, led by the bassoons and low strings, and the A2 or unison theme in the upper winds, are discussed alternatim 5 . To the second of these passages, the one in G minor beginning at 1873 measure 317, he enriched the canonic imitation in 1874 by adding upright entrances in the clarinet, oboe, and flute, as can be seen in Example 2. Here he originates the idea of using the motto theme in both upright and inverted forms in the same canon. It is a model of clarity. Then in 1877 he not only retained the additions of 1874, but also added yet another entrance in the flute one measure after the beginning of the passage, this one in the same sense as the basses, that is, inverted. In 1889 all of these changes were kept. We see Bruckner preserving and extending his decorations, even while the symphony is being shortened. Later in this extraordinary development there is a long crescendo leading to the famous fortefortissimo statement of the motto theme and its continuation.Everyone knows that Bruckner violated one of the basic principles of sonata form here by bringing back the main theme in the tonic in the middle of the development. But that is what happened, here and nowhere else in his work, and there is no one who does not appreciate it as a stroke of genius. The buildup to this event, shown schematically in Example 3, was originally conceived as a development of the A2 theme in the timing of its first occurrence in this version at measure 37, and to all but the first group, an anacrusis or upbeat is provided. But in 1874 Bruckner came back and removed every second upbeat, which has the effect of making the melody divide into four-measure phrases instead of two. Those removals were, in the flute and clarinet parts, in measures 362 and 366, and in the upper horn parts, in measures 359, 363, and 367; in the example, these locations are marked by asterisks. In 1873 there was no imitation of the A2 theme beyond the echo of the woodwinds by the upper pair of horns, but in 1874 after partially suggesting the rhythm at measure 360 in the trumpet, in 363 he creates the full rhythm of A2 one half-note late in the trumpet in dialogue with the lower pair of horns, and extraordinarily, one quarter note late in the bassoons. All of these details were retained in 1877, with a bit of tinkering in the bassoon parts, and it is no wonder that he felt he needed to double the flute melody with the upper division of the first violins, writing “gestrichen” in the devout hope that they would be heard at all. It is quite difficult for the listener to keep track of every detail of the imitation as such, but it seems that Bruckner was content to create a dynamic, pulsating chordal texture which carries all before it. Trumpets enter at 1874 measure 367½ and in 1877 at parallel measure 333½; they are strangely different as inspection of the example shows; for two A naturals in 1874, Bruckner substitutes two B flats in 1877, leaving all the other notes enharmonically the same. Both contours work, though the later one, with its bolder trombone echo, is quite a bit spicier. The inevitable diminution occurs at measure 369, where in 1874, and to a greater extent in 1877, Bruckner brought in entrances of A1, the motto theme, in the trumpets and trombones, to replace the earlier A2 contrapuntal responses of the bassoons. All this can be seen in Example 3, including the double diminution arriving in 1873 measure 373 and 1877 measure 339, but in Example 389, which compares just the 1877 and 1889 versions, it was possible for me to open up the woodwind parts and add the violoncello line. Here we do see some simplification: the rocking accompaniment in the oboes and violins, present in all three versions from the 1870s, is removed, and the violins are immediately put to work doubling the flutes while the oboes are given simple imitations. As the 1889 music proceeds the flutes, clarinets, and violins play the real melody, while the oboes echo it in canonic imitation. Meanwhile, most of the brass writing is simply deleted, and the upper pair of horns double the bassoons’ slow progression at the octave. Finally at 1889 measure 335 the trumpets enter, and the trombones follow with harmony at 337, where the trumpets at last play a new, intricate canon. The 1877 divisions are, beginning at 325, 10 bars, 4 bars in diminution, and 4 bars in double diminution, leading in a total of 18 measures to the unison at 343, while the 1889 divisions are, beginning at 321, 8 bars, 4 bars in diminution, and 8 bars in double diminution leading in a total of 20 measures to the unison at 341. The 1889 passage is thus two measures longer than the common texts of 1873, 1874, and 1877. When one hears the late version, the unison at 1889 measure 341 seems more inevitable, whereas in the older versions, probably because of the ten-bar phrase, the unison comes as somewhat of a surprise. At any rate, the late version may be a bit longer, but now it is also quite a bit simpler even though the same techniques of dense imitative counterpoint are used. It is, of course, wonderful music, but it is eerie to see in the earlier scores the elements from which the seething, pulsating sound is mysteriously generated. After the massive, overwhelming unison recall of the motto theme, the music continues with further development of that theme’s simple contour to a crisis; then there ensue in order the obligatory brief development of the B theme, the famous near-quotations of Tristan, Die Walküre, and the Second Symphony, and finally the true recapitulation. In later symphonic movements, particularly the first movement of the Eighth and the first movement and finale of the Ninth, the recapitulation is highly developed, and corresponds much more to the great unison event of the Third and less to the literal 5 recapitulation which follows it. Then in those cases the crisis leads directly to the recapitulation of the B theme rather than to a previous development of it which had already occurred. Thus Bruckner in his later works telescopes the form, while expanding the remaining elements of it in everincreasing ambition. This “continuation” as shown in Example 4, in the versions of 1873 and 1874, and in a version preceding the 1877 revision to which I have given the nominal date of “1875”. In 1873 there is imitation at the whole-bar level, let by the trumpets and trombones working together, the bass trombone playing the motto theme, and answered one bar later by the horns. The upper trombones play short arabesques which could be considered to descend from the A2 theme. But in 1874 the arrangement of the horns and trumpets is completely redone so that there is a canon at the half-bar level: trombones, upper horns, trumpets in a very strong entrance, and lower horns as can be seen in the example. It is astonishing that these two arrangements of the upper brass both work against the same trombone backup. Eight bars into the 1874 version he introduces the canon in diminution, with note-values halved in length. A bit later, in “1875”, Bruckner redid the work, as seen in Berlin N. Mus. ms. 124,1 and transcribed by Röder on his pages 130–131. Here he put the fourth horn in unison with the bass trombone and reduced the fourth leg of the canon to repeated notes in the third horn. He also removed all but one of the trombone arabesques, probably to achieve greater contrapuntal clarity 6. At this time he started to use the “hat” or “circumflex” accent, which later he would virtually limit to long notes. 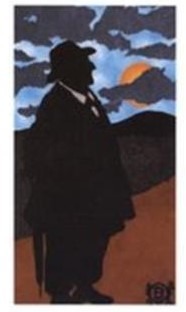 Finally in 1877, shown separately in Example 477, he totally redid everything except the bass trombone, introducing contrary motion in the third and second trumpet, maintaining the motto theme in the first, second, and third legs of the canon and keeping the fourth leg as repeated notes. But when the diminution comes, as it always does after 1873, all four legs contain the motto theme with some degree of both upright and contrary motion in each entrance. Following this passage in all but the last version, there is a hushed reference to A2 in the upper woodwinds, an isolated two-measure outburst of the motto theme A1, then A2 again before the development of B. Those two measures of outburst were scored rather simply in 1873, shown in Example 5, and unchanged in 1874. But in 1877 Bruckner brought it up to date by diminishing the note values and introducing contrarymotion at the same time. The hat accent is used to define three-beat groups in the canon which, because of Bruckner’s canny use of tessitura and the doubling of the third trombone part by both lower horns, can actually be heard. But this carefullyconceived music was a casualty of the revision of 1889, in which this whole passage of 30 measures starting with measure 375 is replaced by 32 new measures. Some people think the new music, masterly as it is, sounds more like the Eighth than the Third, which is not surprising considering when it was done. The coda, clearly modeled on the coda of the first movement of Beethoven’s Ninth Symphony, with its characteristic chromatic ostinato and its anticipated buildup of sound, is a natural place for the use of imitative techniques, as seen in Example 6. Even the woodwind chords as they begin seem like a ghost of the motto theme, but its true entrance is with the three trumpets in unison, echoed by the three trombones in unison and in 1873 a repeated suggestion of A2 in the third horn. The simple, easily-followed dialogue between trumpet and trombone leads us to the ascending chromatic scale and the concluding chords of the crescendo. But in 1874, as shown in Mus.Hs. 6033 and then in the four pages (two sheets) of Mus.Hs. 39.181, originally intended to be inserted into 6033 but for many years separated from it, Bruckner felt that a great deal more was needed. He brought in the third horn after the trumpet, playing the motto theme instead of the reference to A2, and the third trombone after the upper two trombones, to create a texture of real complexity. Both the third horn and third trombone play their entrances somewhat irregularly, and the trombone entrances are particularly interesting, creating repeated and varied cascades of sound, which, as shown in the tattered and miraculously preserved pages of Mus.Hs. 39.181, lead eleven times to the low D of the bass trombone. Meanwhile, as the rhythm is diminished starting at measure 691, the A2 reference is retained in the third horn but inverted. The low D used so freely here is (mostly) absent from the trombone parts of the later symphonies. Mark Cantrell, a bass trombonist and the executive director of Benjamin Zander’s Boston Philharmonic Orchestra, told me7 that trombone players familiar with Bruckner’s music agree that up through the Third Symphony, Bruckner expected the three trombone parts to be played on different instruments: an alto trombone in E flat, a tenor in B flat, and a bass in F which could descend to the B natural below the Great C of the organ. 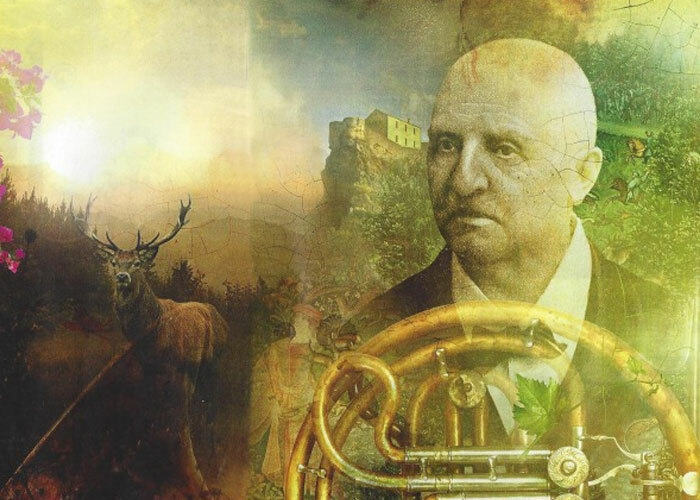 The very low notes are rather quiet due to the narrow bore of the trombone, but Bruckner seems to have expected the low D to be sufficiently audible to be effective, and he used it with enthusiasm. However, starting with the Fourth Symphony he does not write for the trombone below E natural, the lowest note of the tenor trombone, and the assumption is that from that symphony on, Bruckner’s trombone parts are all to be played on tenors, as today they are. This use of the low D and E flat of the bass trombone was written within a year of Bruckner’s battlefield employment of a fourth trombone to strengthen the bass line at the end of the Second Symphony where the line descends to low C, so he definitely had the sound of the low trombone in his ear. Indeed the alto would also sound somewhat different, making the intricate canon that much easier to hear, and making the trombone arabesques starting in 1873 and 1874 at measure 410 (Example 4) sound rather trumpety. Bruckner was not done working, though; not much later (nominally 1875) Bruckner came up with the concept shown in Example 675, page 29, from Berlin N. Mus. ms. 124,2 as given by Röder on his pages 133–134. Here the low D is brought into the picture much more simply than in Mus.Hss. 6033 and 39.181. Here the motto enters imitatively in contrary motion, with the third trumpet rhythmically reinforced by the kettledrum, in measure 684. The diminution begins at 689, two measures earlier than in 1874, leading to simpler eight-measure groups and doubling of the low bass trombone part at the octave, which would surely make it stronger. The references to A2 are now gone for good, and at measure 697, the big half-note trombone chords of 1873 and 1874 are “rhythmicized” into the diminished dotted rhythm, much as he did twice in the first movement of the Second Symphony in 1877. All of this is notated in Röder’s example without the hat accent. Then in 1877, in the Third, as shown back in Example 6, besides removing the ghost chords in the woodwinds, he abandoned the concept of three different trombones, tightening up the tessitura of the parts to accommodate the lack of the low D in the tenor trombone and because of that compression rendering the canon completely inaudible as such. Recent instrument technology is different from that of Bruckner’s day, and there has become available quite a variety of contraptions which could take the place of the old bass trombone, including the contrabass trombone, which is a bass slide trombone in F with a huge bell and two supplementary valves to reach low notes, and the interesting Italian cimbasso, beloved of Verdi, a fully-valved slideless F-trombone with the tubing and valve mechanism bent toward the floor and resting upon it for more practical use but with the bell still facing forward, which could be used by enterprising conductors trying to come closer to Bruckner’s concept using modern instruments. In 1889, as shown in Example 689, Bruckner completely reworked this passage once again with new parts for the orchestral low-F trumpets which in this version replace the high D trumpets of the earlier versions. The texture has cascades like the 1874 parts but not over so wide a range, though the mellower and more harmonically-developed orchestral F trumpets8 may have been expected to make up for that. As conclusion, a new descending scale is given to all of the bass instruments (bassoons, horns 3 and 4, trombones 1 and 3, cellos and basses) which are now free to play it, and the scale carries the bass trombone down to low D at measure 618! The overall result is a loss of some of the elegant mathematical complexity but a gain in sheer power. Example 7, is the full score of the peroration as it became shortly after the preparation of the 1874 revisions, with the last four measures reduced to three and the music of the two penultimate measures made more insistent than in the early version. The source for this is the grab-bag of Third Symphony materials collected by Robert Haas as Mus.Hs. 6013, and attested by Röder on his page 49. This seems to be the only place where Bruckner contemplated changing the length of the symphony before the great revisions of 1876 and 1877. It was included on the Gerd Schaller recording9 , perhaps slightly anachronistically, just so people could hear it. These examples show that Bruckner was not a slave to concepts, nor did he permanently revise this movement with a hacksaw as he did the second and fourth movements. Everything in all four versions, whether original composition or revision, was carried out with the most meticulous and decisive attention to detail, and all are rewarding to study and hear. We can see that the first-version variant of 1874 embodies an intermediate stage in the development of Bruckner’s brass writing, and at least in the coda, attains a certain apogee of orchestrational technique unique in his work. Bruckner in 1874 made other changes to the first movement not discussed here, and to the other three movements as well, and they also evolve through the later versions of the symphony. Dermot Gault’s essential book contains detailed descriptions of the most important ones, which seem not so much to stem from an evolution in style as the brass changes do, but simply from a rethinking and occasional elaboration of the melodic and contrapuntal decisions at various places, notably in the trio of the scherzo. But in the finale something of the same spirit of evolving brass writing is shown in the appearances of the A theme in the development and recapitulation. That theme has the same rhythm as the motto theme of the first movement, but in every other way it is different; it is highly chromatic, not tied to the stately fourth and fifth of the motto theme, with its jagged contour anticipating the first fugue theme of the finale of the Fifth. In the occurrences of that theme in the development, Bruckner decorated it in 1874 with a canonic answer, once again with the canon being led by the trombones (descending to C sharp) and answered in direct motion by either the horns in Example 8, or the trumpets, Example 9. Immediately following Example 9, the version of 1877 contains at measure 309 the theme diminished and upright in the violins and woodwinds, and simultaneously diminished and inverted in the three trumpets; this was an innovation of 1877, retained in 1889 at measure 291, which does not occur in the parallel measures of 1873 and 1874. The theme is answered by the horns again in the 1874 recapitulation, Example 10 and Example 11, and is not followed by a passage in diminution. In 1877 these changes were by and large kept although there were various small metrical adjustments to the measure count, such as the doubling of 1877 measure 385. Late in the third theme group Bruckner returns to the A theme, and quickly thereafter the motto theme from the first movement which shares the same rhythm; this is shown in Example 12. The brass treatment in 1873 is quite simple, there being plenty of C-theme activity going on in the rest of the orchestra; the example shows that in 1874 and 1877 there were a few canonic entries added with a slight lengthening in 1877. In 1889 everything was rethought, and the passage became longer and more complex but was made to serve for the entire third theme group. And the motto theme was dropped. This symphony and the Fourth are the most-revised compositions in Bruckner’s canon, and it is always interesting to speculate on why he made the changes he did. In this study we see that his technique of canonic imitation became more and more refined as he went on, and that despite what he wrote to Tappert, he showed no reluctance to use that technique in the latest revisions of the Third. At the same time the adagio and finale were drastically shortened in 1877 and further in 1889, and Bruckner removed a lot of material that had been diligently and meticulously composed to his highest standards only a few years earlier. We must remember that a great deal of revision, certainly all of that revision which is here dated as 1874 and most of that of 1875, was carried out before Bruckner heard even one note of the symphony performed, which was at a “novelty-rehearsal” in the fall of 187510 . How the revisions of 1876 including the lengthened adagio, and those nominally of 1877, lie with respect to the premiere on December 16 of that year is more subtle. It seems from the incomplete set of parts preserved in the library of the Musikverein, discussed by Röder on pp. 205–219 of his critical report and further by Gault on pp. 85–87 of The New Bruckner, that the first movement, adagio, and finale were all notably shortened in early 1877 in blue pencil and further, drastically shortened for the performance in red pencil, though some of the material removed from the adagio was restored for the print of 1879. These changes in length, almost certainly carried out quickly as emergency measures, do not help the symphony in our eyes and Gault makes the point that they probably did not help the symphony in 1877 either. The result of these confusing actions, only partially sequenced by the old editors’ convention of lead pencil, blue pencil, red pencil, and green pencil which was so helpful to me in editing the Second, is that we may never quite know of what a modern concert performance of the 1877 version of the Third, the first major rethinking of that symphony after all the thought-experiments of 1874, 1875, and 1876, should consist. Nevertheless, we constantly see the clear development of Bruckner’s technique of canonic imitation, showing his keen and growing sensitivity to the acoustic effects of that imitation even in situations where the ear can hardly follow the canon as such. As one follows the increasing sophistication in the developing style of Bruckner’s canonic writing one obtains a window into the expert and intricate counterpoint of the great fugue of the Fifth Symphony. So far Bruckner found substantial benefit in the working-out of the possibilities offered by the simple motto theme of the Third Symphony. He found a similar inspiration in the even simpler motto theme of the Fourth, even though the canonic passages in the Fourth were never as extensive as those in the Third. As to why he made the cuts he did in both symphonies, and what they should mean to the listener today, we are repeatedly reminded of the vast and unbridgeable chasm between our thoughts and the ideas and decisions of even those most close and dear to us.